You are here: Home » What is FireSheep and How to Protect Yourself? I am going to be traveling a lot this month and probably end up using a lot of free WiFi access points. So, when I came across FireSheep I had to write about it. This fact is widely known but hardly considered my so many people using free WiFi access points. 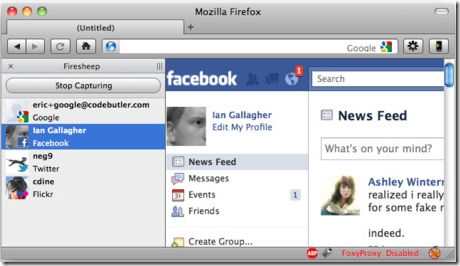 To drive the point home, Eric Butler has created a Firefox extension – FireSheep, for everyone to see how serious this problem is. This is a widely known problem that has been talked about to death, yet very popular websites continue to fail at protecting their users. The only effective fix for this problem is full end-to-end encryption, known on the web as HTTPS or SSL. Facebook is constantly rolling out new “privacy” features in an endless attempt to quell the screams of unhappy users, but what’s the point when someone can just take over an account entirely? Twitter forced all third party developers to use OAuth then immediately released (and promoted) a new version of their insecure website. When it comes to user privacy, SSL is the elephant in the room. With this extension, you get a sidebar and when you start capturing it, you can see who else on the network is logging into sites like Facebook, Twitter, etc and you can start using their account! And it seems to work for pretty much any social networking site in existence! As you can see, with such an easy tool out in the wild, you’d have to be insane to use a free WiFi access point to login to any site that doesn’t use end to end encryption. How to Protect Yourself from FireSheep? So, now that you know that someone else could login to your Facebook account on a public WiFi, how do you avoid that? Firesheep banks on the fact that most social sites default to the HTTP protocol because it’s quicker. The already existing Firefox extension Force-TLS attempts to circumvent this by forcing those sites to use the HTTPS protocol, therefore making user cookies invisible to Firesheep. 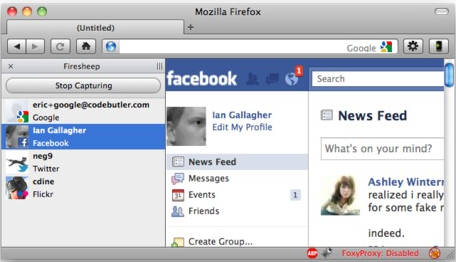 Like the alternative option HTTPS Everywhere, the Force-TLS Firefox extension allows your browser to change HTTP to HTTPS on sites that you indicate in the Firefox Add On “Preferences” menu, protecting your login information and ensuring a secure connection when you access social sites. Again, this solution works only on Firefox browser. So, if you use another browser you need to be aware of the fact that your session and login details could be sniffed by someone using the same wifi network. For eg. if you are on your smartphone surfing away, the login sessions could potentially be seen by someone else. This only applies if you use the public WiFi and won’t affect if you use the data network of your cellphone carrier. You can also use Blacksheep to protect yourself from Fire sheep firefox add-on exploits. Fire sheep firefox is an extension that you can download from Mozilla add-ons website. Fire sheep download is as easy as installing any Firefox add-on. Since someone asked me in the comments let me repeat it is not firesheep software or firesheep program. It is just a Firefox extension. I will write another post on how to use Fire sheep extension soon. This is terrific info, thanks! For Google Chrome users there is Facebook Secure Connection.